Pleasant fall weather in the Sierra was continuing through the last week in October where I had plans to meet up with friends in the Domelands area. Leaving San Jose in the morning around the same time my wife went off to work, I was happy to be traveling against the morning rush hour and made good time to Bakersfield, four hours away. 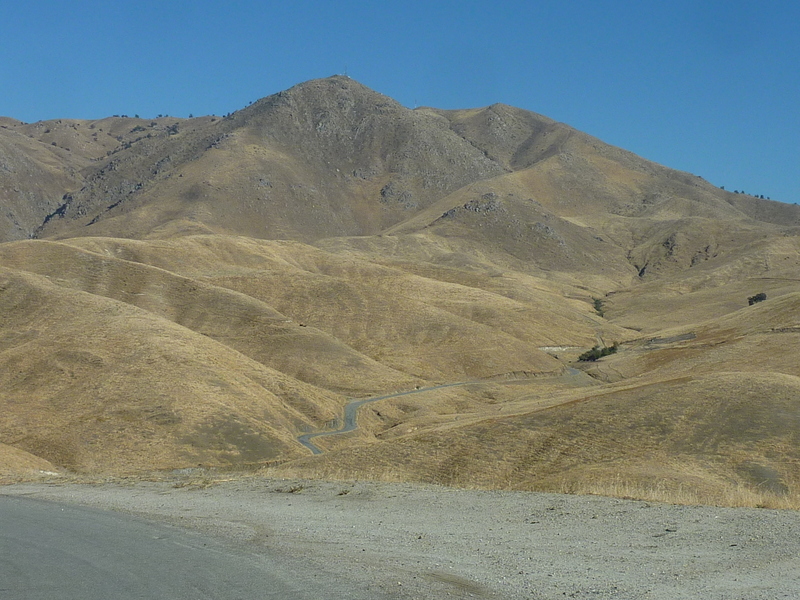 Rather than the usual scenic drive up SR178 through the Kern River Canyon, I wanted to drive up the rural Breckenridge Road that winds through the hills on the south side of the Kern River. In particular I wanted to pay a visit to Mt. Adelaide, a prominent, treeless summit on the lower western rampart of the Sierra range. The lower elevations are all private ranchlands eventually becoming Sequoia National Forest as the road climbs above 4,600ft. There is a small community of homes (seasonal cabins, it appears) at Breckenridge Meadows at around 6,000ft. The road continues over Breckenridge Mtn (with a 5mi spur road going to the highpoint and lookout) and down to the Caliente-Bodfish Rd in Havilah Canyon. This better road can then be used to reach Lake Isabella where I ended up in the evening. Mt. Adelaide is the summit seen from the eastern Bakersfield area, but nearby Peak 3,580ft is higher by more than 100ft, both easily combined in the same outing. Points around Mt. Adelaide have American Tower installations, serviced by a good dirt road running up from Breckenridge Rd. Cattle graze the slopes on private property here, the road gated at the pavement and signed for No Trespassing. I parked along the roadway so as not to block the gate and started up the road. I had seen no one for the initial half hour drive up Breckenridge Rd and expected to have no trouble for the hour it would take to climb both summits. I was perhaps a hundred yards up the road when a truck drove by on Breckenridge Rd behind me, going downhill. It slowed to a stop next to the van as I turned to consider my bad luck. I was expecting someone to get out and shout something and I was resigned to go back and face the music. The truck moved on after a few seconds and continued down the road. Did he not see me? I was a little perplexed, but wasn't going to question it too much. Perhaps he was going to drive down the hill to get cell reception and call the sheriff. Perhaps he didn't see me or didn't care. Either way, I figured I'd get up to the summits before anyone came after me. No need to worry as it turne out - it was the last vehicle I would see driving Breckenridge Rd all day. I turned off the road after a quarter mile to avoid a few switchbacks and take a more direct line up to Peak 3,580ft. Cow trails led up the steep but easy ridgeline I was following, through the dry, brown grass that covers the oak-dotted slopes for miles around. It took 20min to reach the higher summit with views south to the Tehachapi Mtns and Bear Mtn in particular. To the west lies the lower Mt. Adelaide and other points which block views to Bakersfield below. Another 20min hiking west along more cow trail and road got me to the top of Adelaide. The telecom towers are at a couple of intermediate points between the two summits which I bypassed on spur roads, leaving Mt. Adelaide nicely unadorned. A third telecom installation is found another 3/4mi to the west. A brown haze settled in the valley below marred any view of Bakersfield (not that that would be a superb view in the best of conditions). I used another shortcut on the way back to bypass the lower half of the road, momentarily startling a cow dozing in the shade of an oak by the side of the road. After returning to the van I was quick to toss my pack inside and drive out of there before my luck might run out. This is a fairly easy summit just off the south side of Breckenridge Rd less than four mile east of Mt. Adelaide. It lies on private property just outside the forest boundary, brushier than the lower summits, but made easier by cow paths through the thickets. There are two closely-spaced summits with the same number of contours, so it seemed prudent to visit both. The combination is less than a mile roundtrip with about 400ft of gain. I went to the east summit first and found it about 10ft lower than the west summit according the GPSr. I got hung up in descending the higher summit in a brushy maze, but eventually emerged back to the van with only minor scratches. Another 7mi up Breckenridge Rd and 2,000ft higher I came to Breckenridge Meadows and its small community of cabins where the Forest Service has kindly placed signs to remind hunters not to shoot the residents. The two peaks are in the national forest north of the community, about three miles by decent dirt road, on either side of a saddle called Cherry Gap on the topo map. The last part of the road to Cherry Gap has been intentionally blocked by cutting dozens of burned snags across it, keeping even motorcycles out. The best one can do is park at a large clearing on the west side of Peak 6,100ft and walk from there. I parked to the south of the summit, about a quarter mile short of the better spot, not knowing the lay of the land well enough ahead of time. From where I parked it was an easy cross-country hike up and over Peak 6,100ft (covered in trees, no views), about a half mile to Cherry Gap. There I picked up the old road that conveniently goes to the top of the second summit, Peak 5,996ft. The summit is partially open to views, but nothing special as it looks over a sea of trees to the south, located on the west side of Breckenridge Mtn. This short outing took about an hour. Back on Breckenridge Rd, I continued east to the junction located on the crest, also called Hobo Ridge. The spur road heading right goes to the campground and lookout while I turned left to follow the main road as it winds north along the crest towards Lightner Peak, an HPS summit. I parked at a saddle at 6,000ft, just before the road begins its long descent into Havilah Canyon, less than half a mile south of the summit of Peak 6,460ft. The short but interesting cross-country hike features several class 3 summit blocks that appear to be of similar height. I climbed both and left a register on one of them before finishing the short half hour effort. There is a good view of Breckenridge Mtn to the south from the summit. The last peaks of the day are located above the community of Havilah on the west side of Havilah Canyon and Caliente-Bodfish Rd. Located about 3/4mi apart, the two summit lie outside the national forest on BLM land. Access along Goff Ranch Road goes through private property, making this a somewhat murky endeavor. Goff Ranch is located on the other side of the saddle between the two, and judging by the sounds of barking dogs I heard occasionally, it is not abandoned. Goff Ranch Road services several other residences on the east side of the saddle in the lower reaches of the canyon. I parked along Caliente-Bodfish Rd and walked up the access road for a little more than a mile until I reached the saddle just inside the Goff Ranch gate signed for No Trespassing. Almost immediately I left the road to walk north through lightly forested, open terrain to the north towards Rankin Peak. The climb up the south side of the peak is open to view from the road but no one came by during the entire outing. Rankin's summit has open views in all directions. Late in the day now, the sun was starting to set on the Piute Mtns to the east where the HPS Bald Eagle Mtn rises prominently on the east side of Havilah Canyon. To the south could be seen O'Brien Hill in the shade, really just a bump on a ridgeline rising up to the crest of Hobo Ridge and Lightner Peak. I beat a hasty retreat down Rankin to lessen my chances of detection (and also because it was getting colder and darker), crossed the road and headed up an old firebreak to the summit of O'Brien Hill. It was almost 6p now and the sun was only minutes from setting for the day on all the surrounding mountains to the north, east and south. It would be another half hour before I returned to the pavement and the van to end the day.